The much-hyped film brings together about two dozen caped crusaders for a 150-minute battle royale. Marvel's "Avengers: Infinity War" is finally upon us. For the six of you who haven't been bombarded with billboards and bus ads and teasers and trailers, the movie is a crossover event — like "The Jetsons Meet the Flintstones," only if that 1987 made-for-TV movie was the culmination of decades of comic book mythology and cost hundreds of millions of dollars to make. But just how epic? How does one quantify the magnitude of Iron Man and Black Panther in the same movie as Drax the Destroyer and Groot? (Stay with us, folks!) Let's take a look at some of the numbers behind the latest — and grandest — outing from Hollywood's most valuable brand. That's the big one. "Infinity War" is believed to cost somewhere in the ballpark of $300 to $400 million — roughly equivalent to the GDP of the Federated States of Micronesia, or about 11 versions of "La La Land." The movie's estimated price tag makes it one of the most expensive Hollywood productions of all time — right under another Disney-owned franchise installment, "Pirates of the Caribbean: On Stranger Tides." That's the number of views, as of Friday morning, for the first official trailer on YouTube — a two-minute highlight reel of computer-generated mayhem. In other news, an estimated 103.4 million people watched the Philadelphia Eagles triumph over the New England Patriots at Super Bowl LII in February. Pro tip: If you want to lose several hours of your life, watch one of the seemingly dozens of YouTube videos breaking down the trailer. That's the most conservative guess, based on the jam-packed poster, for the number of costumed heroes who join forces and go into battle and do other fun stuff in "Infinity War." But if you judge by the flurry of rumors and speculation online, the cavalcade is probably much bigger — especially after you factor in sidekicks and cameos. That's right, there's three guys named Chris who get top billing in the movie: Chris Hemsworth (Thor), Chris Evans (Steve Rogers, also known as Captain America), and Chris Pratt (Peter Quill, also known as Star-Lord, the goofy-but-rakish star of the "Guardians of the Galaxy" franchise). Fun fact: The screenplay was co-written by a fellow named Christopher Markus. The more the merrier! 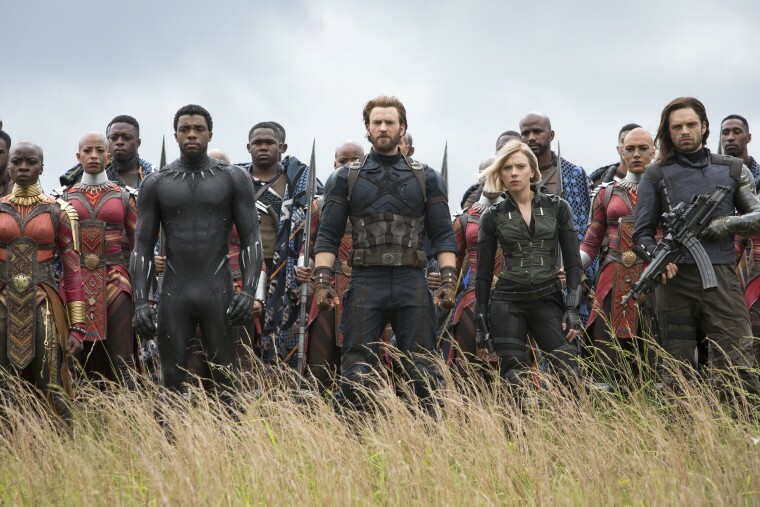 "Infinity War" is on track to gross in the $225 million to $245 million range over its opening weekend, according to Variety — and it could even cross the $250 million threshold. If that happens, the movie would beat "Star Wars: The Force Awakens" ($247 million opening weekend) and become the biggest Hollywood debut in history, adjusted for inflation. That's the Rotten Tomatoes score for "Infinity War" as of Friday morning, putting it squarely in the "Fresh" category. The mostly positive reviews lauded the movie's witty repartee, a mainstay of the series, as well as its apparently bold ending. "The final moments of Infinity War are haunting and impactful and mysterious," wrote Richard Roeper, a critic at the Chicago Sun-Times. And yet "Infinity War" is not even the best-reviewed Marvel movie this year. "Black Panther" currently holds a 96 percent rating, making it the best-reviewed movie of 2018 so far.